Many weapons were used in the War Between the States ranging from pistols, rifles and even grenades. Although gunpowder was, by this time the main weapon of choice in war, swords still played an important part, especially by the Union Army. There were exceptions however, in the Confederate Army and in certain battles. Cavalry was important on both sides but the main weapon used on horseback was rifles. In close quarters, pistols would be used and when the gunpowder ran out, then knives and swords became the final solution for the struggling soldier. This reliance on more modern weapons was the undoing of many a battle since most soldiers were not trained but simply farmers, miners and merchants who were fighting for their homes, their way of life and their ideals. Knives and swords were easier to use by many of these ill trained troops and every soldier carried one or the other. There were different types of mounted soldiers on both sides. The four most organized troops were, in order of importance, Cavalry, Mounted Infantry, Dragoons and Irregular Forces. The Southern Cavalry was considered superior to the Northern version as most Southerners who qualified for it were better horsemen. The South was a more agrarian society and horsemanship was a learned early skill on most plantations and even on the smaller farms. People rode to hunt and towns were more scattered with other forms of transportation, like trains usually reserved for the larger cities. Northern troops came more from industrial areas or cities where walking was the more common mode of transportation and horses, although present, were not needed by everyone. Cavalry were the best trained and required a horse, a rifle and a sword. Northern Cavalry after the first few months were issued their horses but Southerners were required to provide their own; if the horse was killed, they had sixty days to return home and acquire another or face going into the footed infantry, considered a demotion. These systems had its drawbacks but the lack of individually owned horses created the need in the North and the South lacked the funds to provide horses for its mounted soldiers. It also accounted for the fact that the Cavalry troops did not make up a very large group on either side. Another little known fact is that most swords in the years building up to the war, were of European import as the colonies had sword production but not in mass quantities as some of the European centers had. What did make civil war swords so special were their markings. 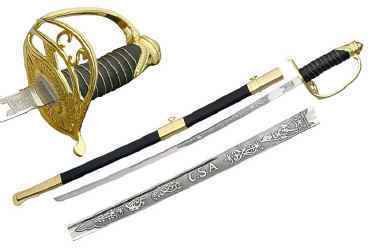 On the Union side, the federal government would award swords for exceptional military service. 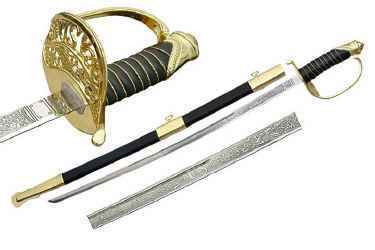 These swords would have etchings on the blades that told the rank and battle for the award and these are highly prized among collectors. The Confederate army had similar etchings on their swords that were usually confined to their superior officers. Cavalry used swords more like a bludgeon than a sword against another horseman to unhorse him, with only sharpening a small part of the blade at the tip to use with a stabbing motion rather than thrusting. Northerners used swords more frequently while Southerners used pistols, as they considered swords outmoded. Yet there were some battles that the sword was extremely important such as the Third Day of the Battle of Gettysburg, when the guns were practically useless with ammunition running low on both sides. Cavalry acted as the intelligence units as well for both sides and they specialized in hit and run expeditions behind enemy lines where a well-aimed sword could easily break through defenses and the horseman escape, a tactic in which the Confederates excelled. Cavalry accounted for just a small percentage of actual troops used and mostly utlized by the North in the first half of the war. Mounted Infantry accounted for the bulk of the troops on both sides and would start on horses and then would go on foot. Dragoons were troops trained in both styles of fighting, cavalry and on foot as well. Mounted Infantry relied mostly on rifles. Dragoons were more focused on light cavalry and utilized their swords but were also often found on foot. By the second half of the war, most Cavalry units fought as Mounted Infantry, using their tactics and weapons on foot. Irregular forces, also called Guerrillas and Partisan Rangers, were mounted forces that rarely used traditional tactics, were found more in Confederate troops,, using any weapon they could find and were the troops most famous for raids and harassment of lines, gathering information for the troops in reserve. Swords utilized were European in nature, ranging from the 1830’s to the last being produced around 1860 and ranged from the light Sabre swords from the 1860 model in Cavalry to the heavier and older model, best known as the Wrist-Breaker from the 1840 Heavy Dragoon model. Different swords bore the markings of their owner’s rank and battle which distinguished him and were beautifully etched with various patterns, making them unique and valuable to the collector of today. copyright © 2001-2014 swordsandarmor.com .